Happy New Year 2017 to all of you. I hope you have had a fantastic 2016. I personally was not productive during that time. I didn't write a single content for almost 8 month. Lucky me, this business is built to earn passive income. Now imagine if you work for someone else, and take 240 days off. You would have been fired! Obviously I didn't hit my goal of $10k/mo. This is because I failed in Paid Advertising. From my previous post, I mentioned about CPA Marketing. And I actually went deep into this giant industry. 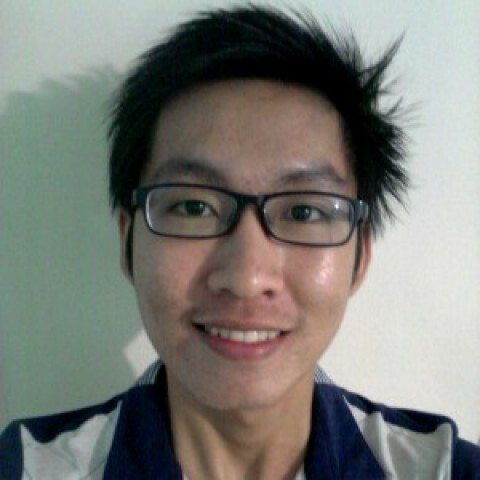 It is so huge that I focused on Mobile Performance Marketing in Sweepstake vertical using Pop traffic source. The reason I stopped doing Paid Advertising is because I don't have enough budget to do the testing. IF there is one thing that slapped me hard in Online Marketing world, it would be knowing that you need a heck lot of split testing to find profitable campaigns. It simply means you have to test object A vs. object B. And see which one is the winner. The winner can be in terms of bring in most most clicked, most click through to the next page, most conversion, or most sales. You can test the headlines, body text, images, call-to-actions, landing page themes, colors, or even the offer itself. You see.. Affiliates are split-testing a lot of things. How do they possibly know which one works? Well it's easy because these people are using advanced tracking tool. And it's not cheap! Wow look great Edy. Why don't you throw in more money into those greens. I wish it was that simple. But, sometime, the placements (websites) that bring you profit only has limited traffic. Even if it has more traffic, you are not alone in that traffic network. There are thousands other affiliates who are advertising in that same websites. They might also be promoting similar offer and this could result in offer blindness, it is when the visitors get bored with the ads they are seeing. Many other factors come to play too apart from Placements and Competitors. It really comes down to speed in my opinion. I know super affiliates are making big bucks by having a team behind them and get through the process as fast as possible. But make no mistakes, paid Advertising is another ball game. You need capital to get started, and balls of steel. Everyone loses their money in the beginning to gather data. And that's why having enough budget is very important. I thought $5K was enough, but it only took me so far. Enough for Mobile Performance Marketing! It might scare you, but you don't need it to make full-time income on the internet. Our friend here can get to $10K month without Paid Ads. So relax! and the commission will come later! SO.. What's next for Edy Chandra? One, I will be still recommending WA to people in my website. But nowadays, I really track what I am doing thanks to the Mobile Performance Marketing experience. Also, whenever I post a new content, I make sure to check it on a mobile device and go through the content as I am the visitor. Two, I am starting to build email list. I send my subscribers content that I think would help them in this Affiliate Marketing journey. "Why You Need to Push Hard in Online Business". Amazing huh? A true marketer never runs out of ideas. Every bid of your daily activities, you can turn them into an idea or opportunity. Now start paying close attention to your doings! Heck, my perspective has changed A LOT. If I have to watch Dr.Oz TV show, immediately I relate him to Affiliate Marketing. This guy gives content to his audience, and promote stuff that is related to the topic. And BAAM, he is making a living. I also reverse-engineer College. How they refer students into the system. There we go! 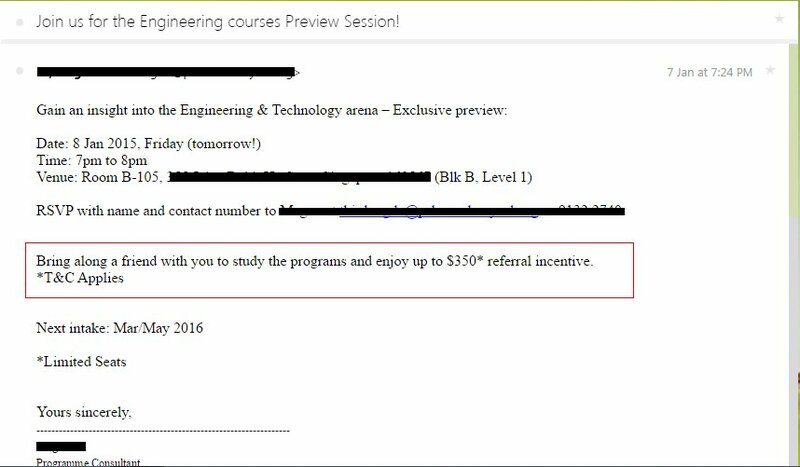 S$350 per sale if I can refer a friend to join Engineering course in my college. Look at all the products around you. Look at the label. Most of them have websites address. Right now. On your table. Grab something and see if there is a website address on that product. It could be supplements you are taking. It could be deodorant you are using. It could be your Walmart receipt. Anything. I don't know about you. It really fascinates me to realize How the "Money Game" works. How it flows from your hands, to the bank, and from the bank to the stock market, and then to big bosses who owns giant companies, and down to their employees which could be you. Also.. I tried to ask my parents this. Dad, why you save your money in the bank. Why do they give you interests? How can they afford paying the employees? Are they stupid? He replied: No son, they use the money to invest on something that will make them more profitable and of course, beyond the interest they give us. Me: Okay, then why not you start investing like they do? Dad: Because I don't know how. Me: Well you should learn. Dad: I am too old for that. Anyways.. My end goal for 2017 would be making enough sales to for WA Las Vegas trip. I have been doing SEO for quite some time now. So I know how it works combined with WA. Every ONE successful post (not evergreen) that is ranked #1 page on Google gives me avg. 10 new WA starter member. If conversion rate to Premium is 10%, it means 1 post = 1 sale. And need 300 sales to Vegas. That means. I should write at least 300 posts that must rank #1 page on Google to be qualified. And that my friend, is my mission for 2017. 300 posts that must rank #1 page on Google! On top of that. I would be doing Video too. This will help a lot. Also, I will start having other stream of income. For example.. People who want to learn ecommerce, I refer them to ecom course. People wanting to learn Youtube, I refer them to Youtube Course. But SEO, it would always be WA. No service can beat this platform thus far. And moreover, the interactive community is amazing. Till Today, it amazes me how Kyle & Carson can build such a great place for Affiliate Marketers or Entrepreneur in general. Do what it takes now. It will pay off NOW, LATER, and sometime FOREVER! I don't fully know what I have got into yet with joining WA but I can't help but feel like I FINALLY found it. After joining this site a lot of the online marketing lingo is starting to make more sense and when I can pull myself away from all the jargon and remember, this is what I do best, it gets really exciting! In my everyday life I visit with people about all different topics and immediately my brain kicks into gear with resources or tools to help them with whatever it is they are looking for, and direct them to them......for FREE! I was glad to come across your blog and am excited to see more and more of these posts where you can learn from others experiences. I don't know where I am going yet, just following the signs (training) and learning all I can on my way and am glad to have connected with you. ed,love reading your stuff,your sheer will power is amazing,It really gives me the desire to learn all,u already know about this business,and I definitely have my mind set on doing so. Agreed on the experience with paid advertising, I paid close to S$4,000 in 2014 to learn pop up ads with direct linking (and just a bit of landing pages) and tried it for 9 months straight. Used $10,000 advertising money to generate $5,000 and couldn't keep going due to limited budget. For anyone new to online marketing it's always better to start with free method such as SEO, even though it may take you longer. Unless you have the money to split test extensively with paid marketing. Great info and advice thanks. Thank you for your inspiration today!! !